Liverpool U18s were dramatically denied three points by a late equaliser in a 1-1 draw with Manchester United on Saturday afternoon. An own goal separated the rivals for much of the match at Carrington, with United’s Di’Shon Bernard the man who put through his own net on the half-hour mark. The young Reds merited the fortunate nature of their breakthrough but momentum turned against them in the final quarter due to Niall Brookwell’s dismissal. Bernard received a second yellow himself in the closing minutes, yet Anthony Elanga clinically levelled in the 88th minute for the hosts and Liverpool substitute Matteo Ritaccio then struck the crossbar. Barry Lewtas’ charges did nevertheless join neighbours Everton on 31 points at the top of the U18 Premier League North with the draw. Both sides allowed themselves the opening 10 minutes to adjust to the difficult conditions, with strong winds swirling across the pitch at the Aon Training Complex. The first moment of real quality was produced by Liverpool. Jack Walls released Fidel O’Rourke with an intelligent pass around the left side of the United defence and the latter quickly fizzed a horizontal cross into the six-yard box, where Paul Glatzel could not reach the ball as he rushed in. Jake Cain worked home goalkeeper James Thompson two minutes later with a low drive from a cleared free-kick that was fumbled, but booted away by Bernard. It was the visitors dealing better with the conditions, their passing crisper, and O’Rourke was the man finding space in particular in the final third. Little surprise, then, that the No.10 was heavily involved in the opening goal. His sweeping pass from the left channel to the right wing allowed Walls to snap in a near-post cross that struck Bernard and carried into the net. Mason Greenwood, the scourge of Lewtas’ team when the sides met in the Premier League Cup last month, should have levelled on 34 minutes. The United forward capitalised on space off the right flank to surge past Brookwell and into a one-on-one situation – but his drive was always rising over the crossbar. Liverpool remained on the front foot at the outset of the second half, though a greater threat from the hosts was evident in the early stages. And the young Reds required two excellent saves from their goalkeeper around the hour. Ben Williams thwarted namesake Brandon Williams, who had combined with substitute D’Mani Mellor and surged into the box, with an outstretched leg to block the angled strike. He then carefully tipped over a Bernard header from Williams’ floated delivery as the home team began to turn the screw in the search for an equaliser. Liverpool’s cause was hindered on 62 minutes, when the U18s curse against United continued; Brookwell’s second yellow card meant the Reds lost a player for the sixth successive meeting. Lewtas reshuffled his personnel in response to the setback and his players dug in commendably while retaining a danger on the counter-attack. James Garner did escape into space in behind but, having twisted and turned to find his preferred shooting position, he swiped his effort wide of the right post. Bernard was shown a second yellow card himself, though United were not finished – Elanga completed a neat one-two at pace at the edge of the box and, once through, threaded a levelling finish beyond Williams. Remarkably, there were further chances at either end – Ritaccio sending a glorious opening off the crossbar and Remi Savage deflecting Greenwood’s shot into the hands of his ‘keeper – but it ended with a point apiece. 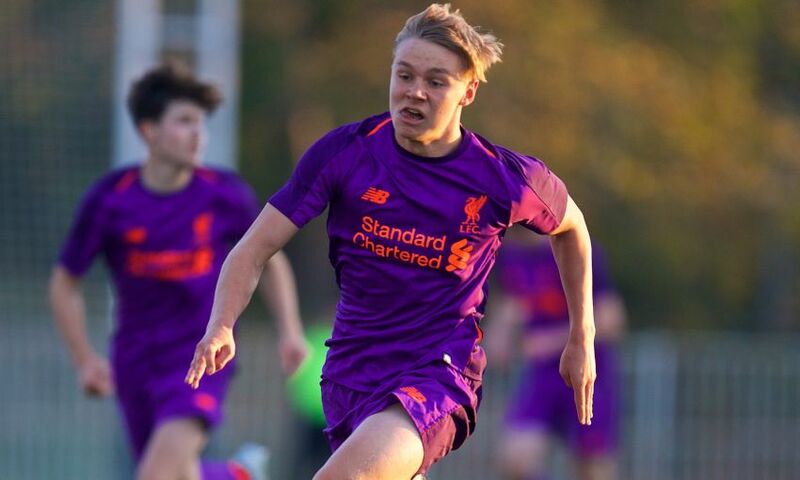 Liverpool U18s: B. Williams, Walls, Savage, Brookwell, Boyes, Clarkson, Dixon-Bonner (Bearne, 81), Cain, Glatzel, O’Rourke (Raitanen, 68), Longstaff (Ritaccio, 76).